I'm in for it now. Today I was assigned a new UFO investigation that may require me to more or less impound a car, get its oil changed, and sprinkle something called magna powder on a sheet of glass in the car's vicinity. 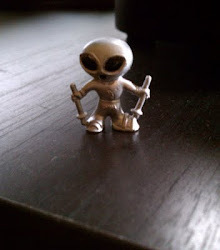 You might think this is all in a day's work for a Certified UFO Field Investigator, but it's actually pretty unusual to have to get a witness' car's oil changed. In fact, this is the first time it's come up. Oh, I've had witness' cars' tires rotated and done the odd valve job, but getting the oil changed is new. And the magna powder thing, believe it or not, came clear out of left field. What's the reason for all this car care, aside from the fact that it's always a good idea to change your oil regularly? Well, my new case involves a low-level fly-by with physical effects to the witness' car. The witness saw a strange lighted object, about the size of a refrigerator, floating in the sky in a field alongside the highway he was driving down. 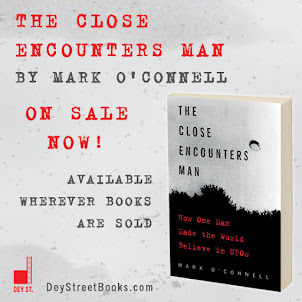 He stopped to look; the object flew over his car and made the lights flicker... The low-level fly-by makes it a Close Encounter of the First Kind, by the way, and the physical effects on the car make it a Close Encounter of the Second Kind, so I'm kind of becoming the Close Encounter Kid, or, as my wife calls me, the Interstellar Columbo. 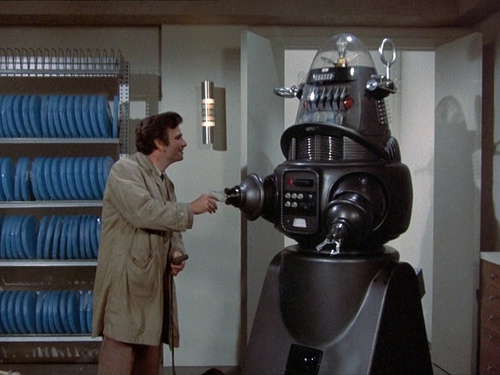 For the record, Columbo never investigated a UFO sighting, but he did investigate a murder once in which Robby the Robot was part of the killer's alibi. Awesome alibi, but Columbo still caught the killer. I'm not sure yet when the investigation will happen, but when it does I am to take a compass along, and test the car for magnetic disturbances. That means I have to find my compass. IF there are signs of magnetic disturbance, it starts to get tricky. That's when I am to sprinkle some magna powder on a sheet of glass to see what it does. I don't recall anything about this in my Certified UFO Field Investigator training; in fact, I just looked magna powder up in the training manual and it's not mentioned at all. So that's a bit of an issue. "Fletcher (he of the national S.T.A.R. Team) suggested that a police uniform shop might carry magna powder. Sometimes you have to buy a whole kit but it's more likely in this kind of store that you could buy just the black magna powder and a brush. You aren't going to brush the powder on to the glass but twirl the brush 3-4 inches from the glass - which could rest on top of the hood/roof...then take a picture. Here are some stores you could call: Of course there is no need to go through all of this unless you can pick up magnetic effects. If you do find them, however, we're going to want to either have you do an oil/filter change on the car or take it in some place. You'll need a sterile jar (baby food or ?) to catch a small amount of oil in and something to put the oil filter in - like a clean paint type can you can find at Home Depot where you can also pick up a piece of glass. Chuck thinks 8.5 x 11 for the glass would be big enough if you've honed in on an area. I'll reimburse you for any costs incurred." Does the description of what to do with the magna powder make sense to you? It doesn't to me. I've read it and reread it and I have no idea what I would be watching for to take a picture of... Also, is there such a thing as a "police uniform shop?" And if there is, wouldn't they not be allowed to sell me anything? Especially anything potentially dangerous? And exactly what part of a police uniform consists of magna powder? I also wonder about getting some oil into a sterile container, like a baby food jar. The only place I've ever put motor oil straight out of a crankcase is a metal or plastic drain pan and then an old plastic milk jug. The idea of trying to get hot, runny oil into a little glass jar from underneath a car does not appeal, and I'm at a loss as to how it will tell us anything about the UFO sighting. Still, I have to do it. Because if I don't do it and this guy takes his car to Jiffy Lube and some Jiffy Lube grunt ends up finding incontrovertible evidence in the oil filter that UFOs are interstellar vehicles, I will kick myself. Good and hard.